Non-slip feet gloves, non-slip rubber frame caps to protect floors. 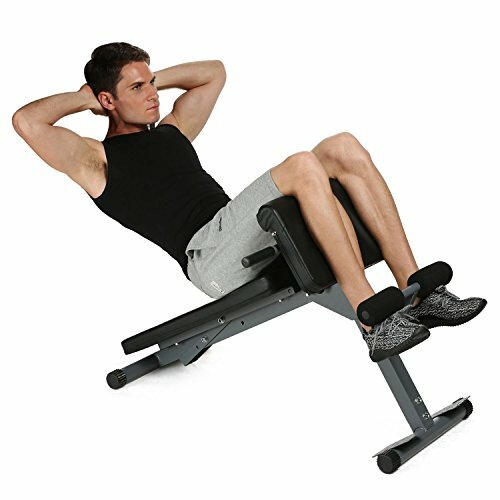 Adjustable footrest, backrest and thigh support to fit height and workout intensity. Material: Heavy-duty steel frame construction with antirust paints. Portable, safe and durable. Adjustable Design: Work your abs in 3 crunch positions ranging from flat to a 30-degree decline. Adjustable footrest, backrest and thigh support to adjust the height and workout intensity. Best Advantage: Non-slip feet gloves, non-slip rubber frame caps to protect floors. 100% SATISFACTION GUARANTEE - Aren't pleased with your item for ANY reason at all? Just let us know for a FULL Refund. Your Satisfaction is Always Our #1 Priority. If you have any questions about this product by Garain, contact us by completing and submitting the form below. If you are looking for a specif part number, please include it with your message.